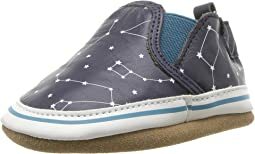 For your child´s first leather shoe, choose Robeez. Since 1994, Robeez Footwear Ltd. has grown from one mom's home-based business to the leading worldwide manufacturer of soft-soled, flexible and lightweight shoes for newborns to four-year-olds. For a Robeez infant, all the world´s waiting to be tasted. That´s why at Robeez, we´re committed to making the safest, durable and comfortable prewalkers shoes possible. You can be assured that Robeez leather conforms to the most stringent guidelines applicable - those set by the British and European Safety Standards for Toys. These standards outline the safe limits of substances that are harmful to human health. All Robeez suppliers must certify by contract that their leather meets every measure. In addition, Robeez goes one step further: we voluntarily conduct random testing on our supplier´s leather. Our rigorous procedures and testing guarantees each pair of Robeez meets the highest standards for integrity, safety and consistent quality that together make Robeez the number one choice for little feet. 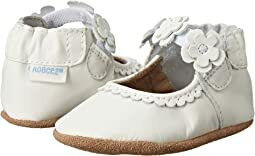 Recommended by experts, such as the American Podiatric Medical Association, and the first choice of parents, Robeez infants´ shoes and Booties are meticulously crafted using genuine leather. Soft, skid-resistant soles encourage pre-walkers feet to flex and toes to grip, promoting developing feet to grow naturally. When choosing an infant´s first leather shoe look for thin soles that stay in place, allow flexibility and that are lightweight. 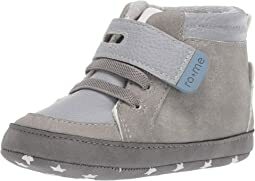 Robeez infants´ shoes offer peace of mind with their durable, breathable and skid-resistant shoes all while still being fashionable. These shoes are made for every type of occasion and personality; from the breathable summer sandal to the sanctified Baptism and the even the playful playground slip-on, Robeez has the shoe. Available in over 70 designs, Robeez infant and pre-walker footwear is sold internationally at thousands of boutiques and specialty stores, including some of North America's most recognized retailers. Today, Robeez has a multi-lingual, multi-currency website with offices and distribution throughout North America, Europe and Australia. 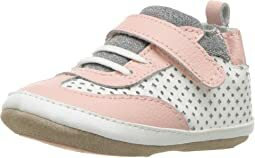 Cute soft soled shoe for toddler! My almost two year old loves these and wears them everywhere! These shoes are adorable. Unfortunately, the sizing is absolutley baffling. My son is 10 months old. I ordered literally EVERY SIZE of this shoe, starting from 18-24 months (this was supposedly the size I should have needed according to their website). They were massive! Like, big enough for a 2-3 year old. We sized down to 12-18 months, then 6-12 months. Both were still too big. Finally, I found a review that said that someone's 10-month-old could fit into a 0-6 month because the sizes were so big, so I ordered that. Guess what? Too small! So incredibly frustrating. I won't be buying Robeez again. Thankfully, Zappos made the experience pretty painless. 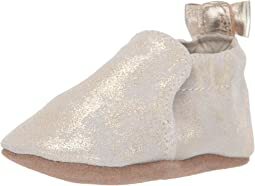 Super soft and cute crib shoes for babies! size 3 fit my 6month old perfect with room to grow. Great price and great product! Love these but wish Zappos sold as single pairs, not two packs. The pink are adorable but not a fan of the glitter and I don’t need both pairs... so they will be going back. 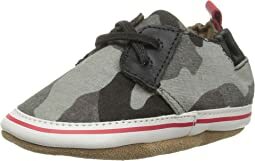 I like these shoes but they are too big on my 14 month old. He’s growing out of his Stride Rite 4’s and I thought this would be the perfect size. I’m going to keep them as he’ll grow into them eventually. These are even cuter in person than they are online. I bought these in size 6-12month for my 12 month old and they fit perfectly (I originally ordered 12-18 month which were much much too large). His feet measured 4.1 inches long and I imagine They will last him for a few months before he outgrows them. They are a little tough to get on him but I imagine that will stop once they are worn in a bit and less stiff. 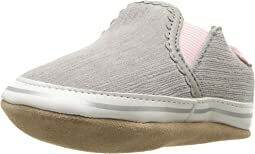 They are perfect for walking around the yard or playground or out in public. I ordered these for my 12 month old. I got the 12-18 month size since his feet measured right between 6-12 months and12-18months. Theyre cute and have great quality and I was so excited. Well theyre HUGE! My little guy has outgrown his 9-12 month shoes (different brand) so I thought he would be relatively close to fitting but theyre still an 1.5 inches too long and just fall right off. Plus theyre really wide as well. It has been almost a month now and he is nowhere near fitting into them. I threw away the box so I can't return them and he will probably need hard soled snow boots by the time they fit so it was essentially a waste of money. But I think in theory if they could fit they would be nice shoes. 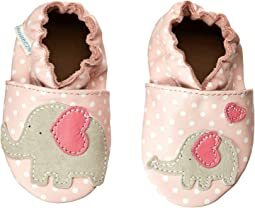 These baby shoes are absolutely adorable! 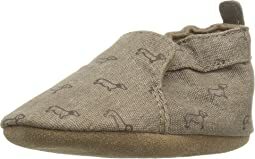 These are awesome for home wear as our floors are tile, they keep my child cozy and the style is soooo cute! 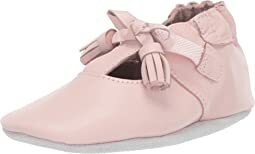 So I’ve learned when Robeez comes out with an adorable shoe that fits well and is comfortable for my LO, I just go ahead and buy it in current size—6-12 months—as well as the next sizes up before it sells out. These are just THE CUTEST shoes! And, yes, you need to make sure Sebastian’s dorsal fin and tail isn’t bent when you put them on but it’s no biggie. Get these!!! These are about a size too big for my daughter however they seem like they are comfortable and are great quality so I’ll keep them for the fall when they should fit her. Great for my 1-yr old who is just learning to walk! I use these shoes indoors only because they will wear out in a day or two if used outdoors. These are adorable. They fit my toddler well and stay on her feet all day. Very cute but run very large. Had to size down to the 0-6 for my 10mo son. He is in size 12-18 clothes from almost everywhere else. The shoes are super cute but don’t hold up at all? these aren’t but a month old. 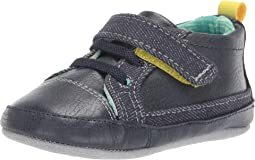 When I first opened these they looked like they might be a little big, but when I put them on my son the way the elastic around the top adjusts to the foot, it made them fit just right. He played in them, rode in the car, and they stayed on his foot! I am very pleased with these and will be buying more. These shoes are really cute but the width is really wide. Second pair bought for my grand daughter. They stay on, are adorable, and good for the early walker or crawler. I had to google to find the shoe-size equivalents, but once I did that I was able to order the right size. 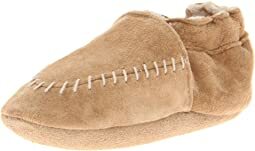 Comfy slippers for our cold house. 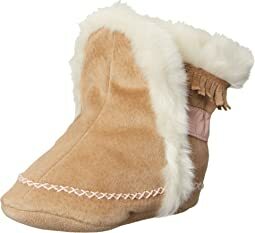 My 2-yo loves them, and they're cozy inside. Yet another well made and super cute pair of shoes for my LO. These are light but not flimsy at all. LOVE these!!! So well made and just too adorable on my LO! Wish Zappos would restock all the sizes! I’ve recently discovered the Robeez brand and am SO happy I did! These are just too cute and very well made. Because the sizes allow for foot growth, the shoes aren’t exactly going to fit—the 6-12 month size on my nearly seven month old is bigger than his foot but it’s supposed to be to allow for extended use. The way the shoes are elasticized around the opening holds them in place despite my LO’s vigorous wiggling. My 13 month old is very small but walking and needs shoes. The first size with hard sole is 3 in most brands. 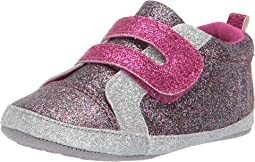 I found these in size 2 which she needed (3-6 months). 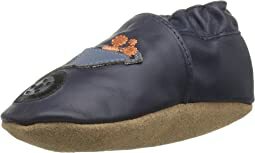 Perfect with the rubber sole on teh heal and footbed. she is walking better already in them, now that they are not the size 3 i had found first. Thanks Roobeez for making a great shoe!